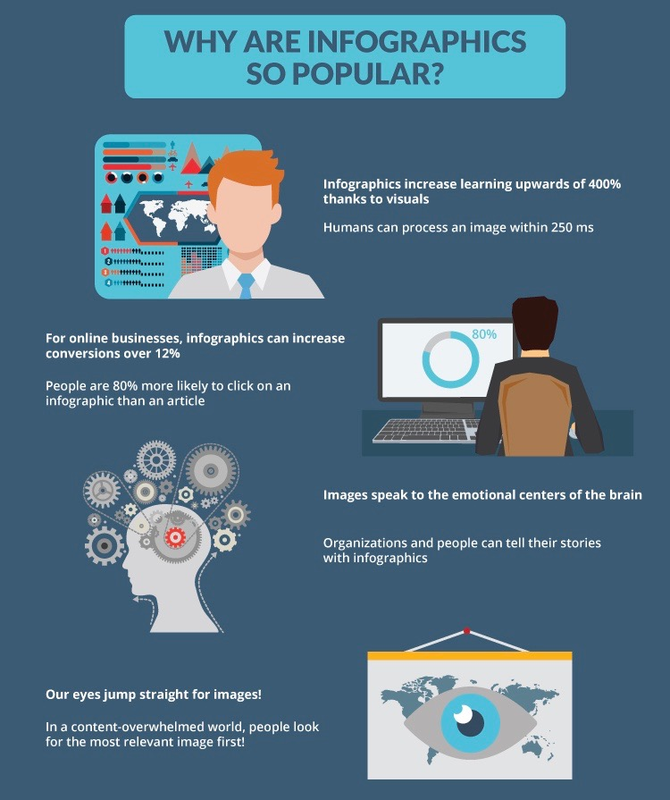 Did you know that infographic creation increases by one percent every day? That means small business owners and entrepreneurs just like you are creating awesome images that incorporate data, interesting facts, and their own brand to promote their products or services. Infographics can be used multiple times across multiple platforms. What does this mean for you? Less time, less money, and more conversions, website traffic, and exposure. Really, you’ve got nothing to lose when you start creating your own infographics. If you’re still not convinced, here’s a quick look at all the ways infographics can help you and your business from Easel.ly. For small business owners, content creation takes up a large chunk of our time. Most of us are worried about the time it would take to create an infographic on our own, and the quality of said infographic after spending hours grueling over it. Using tools like Easel.ly, you can create images from templates, simply inserting your own data, images, and logos to make it truly yours. Simple, quick, and impactful. The other struggle many small business owners face is the issue of money. It’s not exactly a renewable resource when you’re either starting out or just starting to grow, so you want to be smart with where you invest. Many infographic creation tools give you plenty of wiggle room in your budget, while also giving you massive returns on your investment. Whether you count conversions as email subscribers, blog signups, course purchases, or product sales on your website, infographics can help you see higher numbers on all fronts. People are more 17 percent more likely to be persuaded by visual imagery, which means visuals should be an important component of your marketing efforts including email marketing, social media, and your blog. The biggest way that infographics move leads into conversions is by increasing your website traffic. To do this, you must create an infographic that is visually engaging and encourages action (such as clicking through to your landing page). The most important aspect of this step is making sure that you embed your infographic code into your website so that, whenever the image gets shared, it leads back to your site. Think about the places you’ve seen a single infographic shared. You’ve definitely seen them on Facebook and Twitter, but what about on Instagram, Pinterest, or even LinkedIn? Have you seen infographics in emails? Blogs? Advertisements? This is the biggest reason you should really start using infographics today — they can be used everywhere to make your business or brand visible. Create your first infographic today! In essence, you spend a few minutes creating an infographic and you can spend the foreseeable future using it in all of your content. Need some infographic inspiration? You can find infographic examples from Constant Contact here.